Sometimes it’s the simplest games that wind up being the most fun. Case in point: iCopter by Matthew Hertz, the iPhone/iPod touch adaptation of a popular Flash-based Web game in which users attempt to fly a helicopter through a cave while avoiding obstacles and earning points. This is about as simple as it gets, with the game feeling like a perfect port of its Web-based counterpart. 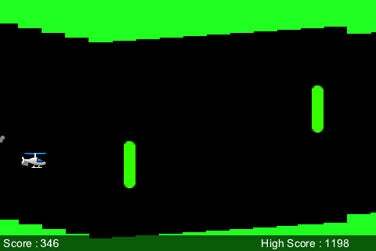 Simply tap the main screen to start and you’re off to the races, frenetically trying to ascend and descend in time to avoid the next floating obstacle while the game tallies your score. Give It a Whirl: Touching and releasing your finger from the screen makes your chopper ascend and descend in iCopter, as you try to avoid those obstacles and rack up points. A strange set of controls makes the game initially infuriating, but once you become accustomed to the controls, they help make iCopter fun to play. Upon tapping on the “Instructions” screen, you’re told to touch the screen to move the helicopter up and down. Once you follow this advice, you’ll discover that you’ve taken the the instructions too literally—your helicopter will crash within seconds of beginning a new game. After a while, you’ll realize that touching the screen makes the helicopter ascend; removing your finger is what causes it to descend. Sort this out, and iCopter becomes infinitely more enjoyable. You can adjust the game’s speed, background color, helicopter style, and other settings via iCopter’s preferences. (These are found in the iPhone’s Settings screen and not in iCopter itself.) You can also customize when you’d like your high score submitted over the Internet. The current record tops 150,000 points, which seems impossible to beat, though that won’t stop players from trying. Where a simple, fun title is concerned, iCopter does its job just about perfectly. Still, there are some shortcomings that could be addressed. When you install the game, for example, you’ll either love the control scheme or hate it. I found that the included instructions left me guessing as to how to touch the screen and control the helicopter. Instead, a quick link to a YouTube video or Web site with a tutorial video could be included to settle the issue within seconds as opposed to forcing players to flounder with the control scheme for a while. iCopter would also be well-served by the inclusion of sound effects or a music track of some sort. The lack of these extras certainly keeps the game’s file size small, but something’s missing aesthetically. Even with these small shortcomings, iCopter is completely addictive, extremely fun and becomes an app you go back to time and again to see if you can’t beat your old high score. iCopter is compatible with any iPhone or iPod touch running the iPhone 2.1 software update.